Karl reMarks: The Folly of March 14’s STL Gamble. As the first day of parliamentary talks kicks off in Lebanon ahead of a vote of confidence in the new cabinet, the March 14 coalition began its first real stint in opposition. There were no surprises as its MPs took to the platform, the coalition had already announced that the government’s commitment to the Special Tribunal for Lebanon (STL) was going to be at the heart of its opposition to the ministerial policy statement. Despite the significant local, regional, and international shifts, March 14 seems to be intent on pursuing the tribunal as a central political goal. To complicate matters further, the new opposition is resurrecting the debate about disarming Hezbollah in conjunction with the discussion about the STL stance. This is an unwise move, March 14 is missing a chance to reenergise itself and find a renewed sense of purpose. While the new PM Najib Mikati appeared to be making the ‘right’ noises about the STL, his statements were quickly contradicted by his political ally Hezbollah leader Hassan Nasrallah in his speech on Saturday night, as he insisted that the party would never surrender the four suspects that were named in the STL indictment. Furthermore, while Mikati insisted that the policy statement shows the government’s commitment to the STL, in fact it’s a semantic contraption designed to avoid clarity. Article 14 of the statement includes the ambiguous promise that the government ‘will follow the path of the Special Tribunal for Lebanon’. ‘Follow’ in Arabic leans more toward ‘observe’ than ‘pursue,’ hence the ambiguity. While March 14 is right in its insistence on discovering the truth about Rafik Hariri’s assassination, it has placed too much faith in the STL and ‘international justice’ in pursuing this goal. The STL indictment confirmed what most people already knew, it pointed out the alleged operatives but refrained from naming the political decision makers and the leaders who gave the orders. This is a strong indication that the STL and the international community behind it, read the US, have imposed a clear ceiling for the tribunal’s investigation. March 14 seems to be still too dependent on international justice to understand the significance of this limitation. Furthermore, March 14 itself had placed another ceiling on the tribunal's work when Saad Hariri publicly absolved Syria of any role in the assassination. With Syria out of the picture, the most that the tribunal can deliver is a confrontation with Hezbollah that it can't possibly win, especially with the West, thankfully, unwilling to intervene. Those who claim that the US needs a pretext to pounce and punish Hezbollah ignore the events of 7 May 2008 when March 14 was left to face the music on its own and was quickly defeated. It still seems that Walid Jumblatt was the only one to understand the consequences of Hezbollah breaking its promise to use its weapons internally on that occasion. His subsequent u-turn was a direct result of this, turning the most enthusiastic supporter of the mythical 'new Middle East' into a middle-of-the-road pragmatist. The remnants of March 14 however seem intent on gambling on the STL. But this weakens their legitimate demand for Hezbollah to disarm as it seems to envision the STL as mechanism for achieving that. Even if the West was willing to actively pursue this, the likely outcome would be another protracted civil war. While the threat of Hezbollah’s weapons shouldn’t be a reason not to pursue justice, March 14 could have convincingly defended this process had it been conducted by a reformed Lebanese justice system but cannot do so while the specter of international interventions is what it’s hoping for. With its current stance, March 14 is missing a chance to pin its hopes on the Lebanese people rather than on external intervention. For starters, it’s facing a weak cabinet that appears to be lacking in purpose and is already showing signs of wear and tear. It could have, and indeed could still, play a successful role in opposition relentlessly attacking the cabinet and subjecting its policies to scrutiny. In the process, it could formulate a political vision that eventually brings it back to power, away from its reliance on fickle external agents. This would help resurrect Lebanese politics as well, and banish the demon of lowest common denominator governments. The main problem concerning STL is the definite fact that it cant seek the truth of who committed the crime, if it is somewhere other than the triangle Iran-Syria-Hezbollah. That is more than enough to make it an easy target to hunt down -fairly. As I mentioned on twitter while commenting on your previous post, we always need to keep the "franchising concept" in mind while tackling Lebanon's politics. STL is just a detail, one tool in the kit of the pre-mentioned franchising agreement between US and co from one side and March 14 as their domestic representatives against Iran-Syria franchising agreement with Hezbollah, who in return have a well trained armed power to counter the international and economic power of their opponents. This is the cure of the struggle. Why didnt March 14 go for a domestic alternative instead of STL? That wasnt an option, as it doesnt fit the requirements of the main players in the game all outside the battlefield called Lebanon. As simple as that. Its more accurate to suggest that the STL requirements led to reforming March 14 as a political power rather than assuming it was the other way around. We just need to revue the time, money, resources, and effort invested by the main franchiser on this project to counter the Iran-Syria-Hezbollah investment in the second hand. Both sides are committing mistakes, its about who make less mistakes than the other. 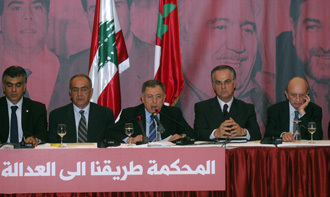 Regarding parliamentary talks, what is interesting so far is Berri's (March 8) strategy. From the morning round, it seems they are letting as many March 14 members as possible talk in a row, exposing the repetitiveness that will make public too bored to follow. No clashes that catch public opinion. And some jokes that show the public "well...there is nothing wrong...they just want to talk and go home, no need for tension"
Again, as I mentioned on Twitter commenting on your previous post, it is all about working on public opinion at the moment. After the battle for power being settled (for the time being) for one side, the other side need to show the ability to create chaos - March 8 will try to not let that happen. On a personal note: Keep things calm for one month as I'll be in the country during this period! My problem with this concept is that it can become a form of fatalism. That is nothing can change because these are the rules of the game. This is a very limiting attitude. The alternative is to insist on the national and democratic choice, and remind both sides of that. It might seem unlikely that any side will listen, but without formulating clear alternatives like that, we can't move beyond this stalemate. This is very different from the silly 'secular' demonstrations that have no political content but only superficial a-political messages, and a very elitist one. If you don't galvanize the public towards different political aims, nothing will change. Meanwhile, both sides are letting us down with their lack of independent thinking and we need to be very critical. Have a great time, nshallah rawaq! But don't you think the ceiling set by the United States is only an imaginary one? By implicating members that are high up in Hezbollah, the US is implicating the entire party and its leadership. Also for the ceiling imposed by Saad Al-Hariri, many opponents of Hezbollah if not most are already making the point that the party did not act of its own accord, but it was merely following the orders of Iran, Syria, or both. Also, I don't believe the strive for justice plays a role in why March 14 are pushing for the STL. Justice is a lofty ideal for which there is no place in politics. March 14 is pursuing the STL in order to gain political clout in the face of Hezbollah, which is of course understandable. The artificial choice between justice and stability has no basis in real life. I honestly believe Lebanon has nothing to gain from the STL, or any other tribunal for that matter. The knowledge of who was behind the assasination of Rafic Hariri - be it Hezbollah or be it Israel and the US - will have no practical benefits to the Lebanese people. No, the US is setting the ceiling very clearly because it doesn't want to pursue this further. The main thing that interests Obama in the Middle East now is disentanglement, not further adventures. His position on Syria proves that. As hard as it is to believe, Lebanon and Hezbollah are not his central preoccupations. We can't say that justice doesn't have a place in politics, its place is very important but it's important that it's universal. Otherwise, you can't ask for justice for Israeli war criminals for example, would you? The point here is not Rafik Hariri himself, but the idea that you live in a country in which the prime minister is assassinated and that's considered normal. The point is not to stop there but to go all the way back to the start of the war and uncover all the perpetrators, not to say let's forget about all of it. I remain, as I was on day one, firmly against the STL. If justice or truth are to be found it has to be through the Lebanese system, international justice is a tool for Western policy. But that's not the same as saying we don't need to know. That's a divisive logic that will store resentment and blow in our faces again. Would you say for example that we don't need to know what happened to Moussa El Sader? I don't see how knowing what happened to Moussa El Sader would affect what we need to do about the future. When I say I don't care, or I don't need to know who was behind the Hariri assassination, I don't say it to provoke anyone for the sake of provocation. So no, knowing what happened to Moussa El Sader and Rafic Hariri is not a priority for me. I would be interested to know the truth about both, but only out of curiosity, and so I would not be willing to pay a high price for this information. When it comes to the United States, I'm sure Obama would like to pull out of the swamp he has gotten himself into, and yet the US has vested interests in the ME that it is unable to abandon. The US administration's position on Syria has been ambiguous only because it is weighing its options; fearing what might come after the downfall of the Assad regime and the success of the revolution, and yet not fully willing to support a state that it considers to be a major source of support to 'terrorist organizations'. While Hezbollah is not the only (or the most pressing) problem on Obama's plate right now, the party still factors into any plans the Americans might have for the ME, as Hezbollah is considered to pose a threat to the safety of Israel and American interests in the region. Regarding justice with respect to the Israeli war criminals you mentioned, I feel it's more a matter of revenge. When I think of Ariel Sharon or Ehud Olmert and of the crimes that they have committed, I feel the need for revenge, not a need for the fulfillment of an abstract notion of justice. There's a real problem here: the mere fact that we have to justify why assassinations should be investigated is a sign of major breakdown. It doesn't matter if it's an average citizen or an ex-prime minister/head of a large political group, that's a twisted logic. However, if it's a political assassination then dismissing it is an endorsement of the act itself. If the perpetrators believe it's a legitimate political assassination, then effectively you're asking them to admit defeat. In which case, you can't blame them for trying to seek support somewhere else by using the 'national' argument, the assassination has already rejected that. In short, this formula is a recipe for continuing civil strife and the dominance of the powerful. Keeping in mind that this is a sectarian not a political struggle, then it's a full endorsement of a sectarian war. We're back where we started. Who are we asking to admit defeat if we dismiss the assasination? Could you rephrase that part, I don't get what you're trying to say. Even if we did carry out trials, I am under no illusions that anyone will be brought to justice, so I don't see how the dominance of the powerful will wane, whoever it is that we consider to be behind this assasination. I don't agree with the point you made about how dismissing the assasination would be an endorsement for it. I just believe the trials in this case are of no concern to me, and if I did endorse a trial it would only be out of a sense of duty to my countrymen, and honestly the idea of nation-states and compatriots means almost nothing to me. I was also a little offended when you asked me about Moussa Al-Sader before, but only because it appears you have taken a wrong image about me, but that is completely understandable. Regarding your last statement, it is unfortunately a sectarian struggle, you are right. But my views and my comments are purely political, and even though they will be construed within the boundaries of Lebanese sectarian politics, those were not my intentions. I cannot alter my views of what is rigt and what is wrong within the political sphere so that they conform to what Lebanese sectarian society expects of me. My comments were to be understood purely outside of Lebanese sectarianism. 'them' refers to March 14. In Lebanon, there are no 'individual' arguments, even if you believe that you hold those convictions because of your own analysis, they still sit within that context and reflect a dominant view. Not exclusively sectarian because Aounists hold that view as well as Hezbollah supporters, but nevertheless constructed on sectarian assumptions. I am able to critique both March 8 and March 14 because I am pointing out problems with their proclaimed commitment to sovereignty and the national interest. In the absence of political alternatives this is the most powerful critique we can develop. You can't dismiss the nation state, for the moment that's the framework that we exist within. Like it or not, it's reality. If you're dismissive of that, then you can't blame any Lebanese group for allying itself with the outside to advance its own interests. Why not if the nation-state doesn't matter? Finally, the Moussa Al Sader example wasn't intended to appeal to your affiliation at all, I genuinely believe it's an important incident of the war that needs to understood because of what the man represented and the circumstances that led to his appearance, and their impact on the war. There are hundreds of questions like that, and instead of sweeping them all under the carpet, we should answer them all. Finally, there's a hint in this post http://karlremarks.blogspot.com/2010/10/blog-post.html of why 'leftist' language was a pretext for advancing the goal of communal authority over that of the state in Lebanon, a central goal of the National Movement. It's worth reading Wadah Sharara's full argument. I mention that because using leftist language doesn't absolve us of collusion with the confessional logic, if we're not rejecting that logic categorically. Thanks for the link, I'm very interested to look into it.